This Home is Simply ... BEAUTIFUL ! This magnificent Estate is in pristine condition ... offering 1860's charm with 2018 expectations. In late 2018 this home was completely restored ... New Kitchen, New Bath's, New Floors, New Windows, New Doors and a New Blue Stone Patio and a Magnificent New Deck which overlooks the wonderful 15 Acre Hinckley Pond! The restoration included a complete replacement of the furniture, linens and Kitchen and Bath utensils and necessities. Simply stated ... This home has 1860 Charm with every 2018 Expectation - 10 Flat Screen Televisions - and completely air-conditioned! Spectacular property nestled amongst the rolling hills of Historic Route 6A (Old Kings Highway) less than a mile from quaint Barnstable Village. Overlooking tranquil Hinckley Pond you will cherish the sunrise and sunset each day. This estate home is situated on a breathtaking 2+ acre parcel of manicured landscaping! This Estate Home is located on the site of the Homestead of THOMAS HINKLEY, Governor of Plymouth Colony from 1681 to the Union with the Bay Colony in 1692. The home features 3 private suites all with water views, highlighted by the master suite, complete with fireplace, walk-in closet, Jacuzzi tub and a large custom deck overlooking the 15+ acre Hinckley Pond. The 4th suite is cozy and warm with a fireplace of its own! The home's open floor plan is filled with sunshine and is perfect for entertaining. The “Great Room” is complete with a 50' flat screen entertainment center, wet bar and opens to a spectacular sun room with views of the open field and pond. The Bistro kitchen is charming and the 3.5 bathrooms are sparkling. Barnstable Village is located along Historic RTE 6A - the scenic road of Cape Cod known as Old Kings Highway. The Village is a short stroll from the Homestead where you can shop, dine and antique. The beach is a short drive from the home and the center of the Cape - Hyannis is less than 5 minutes. Easy access to both land and sea, Breathtaking Views, Privacy and a Quiet Elegance! Relax and enjoy Old Cape Cod! Jim Norton is a local businessman and real estate investor, who in 1986, with his family. moved from Westerchester, New York to the Cape. Jim takes pride in everything he does and the Governor Thomas Hinckley Estate is a glowing example of that pride. The Governor Thomas Hinckley Estate is in PRISTINE condition. The owner, Jim Norton is constantly upgrading the estate and adding all the modern conveniences which you have come to expect in 2017. From the bed linens (which are new each season and designer quality) to the new Patio Furniture. 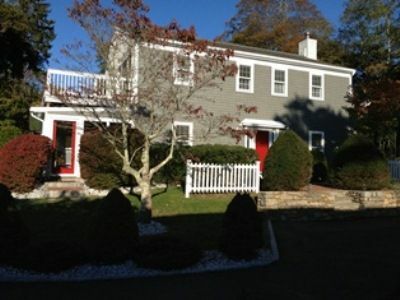 You simply will not find a property on Cape Cod that offers you more ! The Governor Thomas Hinckley Estate is centrally located in the center of Cape Cod. The home is very large and offers all guests a lot of privacy while providing extraordinary space for gathering of family and friends. This Estate is very entertainment friendly ! jetted tub, In the Master Suite ! GIAGANTIC ! In the Upstairs Bedroom with the Views ! toilet, shower, Located off the Great Room / Washer & Dryer ! 3 and 1/2 baths with 2 laundry rooms are sparkling ! The beaches of Cape Cod are simply wonderful! Barnstable Village is less than 5 minutes where there are fine restaurants and quaint shops. Hyannis - The heart of Cape Cod is 10 min. Millway Beach 5 Minutes, Sandy Neck Beach 10 Minutes, Craigville Beach 15 minutes. The property sits on Historic Hinckley Pond! 15 acres. However, the pond is NOT for swimming! The 15 acres Hinckley Pond is part of the breathtaking views from the estate ! Dual Washers and Dryers in seperate locations of the home! Wi-Fi throughout the Estate ! Kitchen is fully functional with all modern appliances. Dinnerware for 12! 5 Flat Screen Televisions - 50' in the Great Room! One of the Best entertainment properties offered on Cape Cod! This Estate Home is a perfect entertainment friendly property! Beautiful historic home with a large yard & gorgeous view. The property exceeded my expectations! We had 4 couples and a doggie. The house and grounds were beautiful! There was plenty of room for everyone to sleep, eat, relax, and spread out, and it was so nice and quiet hanging out in the patio or in the yard. The kitchen was appointed very well and we made Striper Bass two nights from the boy's fishing trip, and a shrimp boil one night with the huge pot we found in the cabinet. Each of us had our own bedroom, and I wasn't worried about waking anyone else up by making coffee, or playing in the yard w/my Grand Dog. There were plenty of clean towels, and two sets of washer/dryers if you needed them. James was very easy to work with. I would highly recommend this house to anyone with a larger group. We very much enjoyed our stay at Jim Norton's home this past August. We were three families with two dogs and there was plenty of room for all. The house seems to have been recently updated - with a kitchen that caters to your every need - and still maintains its original charm. The outdoor patio is great and the vast lawn was perfect for wiffle ball games! Jim was very responsive to our questions. We would absolutely rent this property again.. highly recommend! Everything was perfect! The house was clean and beautiful! We felt at home from the moment we arrived! The owner was awesome, very kind, helpful and generous! The area was peaceful and quaint with beaches and sightseeing opportunities in close driving distances. I would totally recommend staying here and I would definitely return again!! Lovely and very well appointed house with all mod-cons. Our families enjoyed relaxing on the terraces and and the kids loved going down to the lake to fish and row on the inflatable boat we brought with us. Beautiful sunsets every evening! Only small hitch was that the previous renters took the beach passes with them when they left, but James solved this by offering to reimburse us our beach parking costs. The beaches were great for both swimming and beach combing. Everyone had a memorable stay. Thank you for your kind words! We enjoyed having you as our guest ! Wonderful vacation rental! Would go back in a heartbeat! Can’t wait to rent this lovely home again! Excellent landlord who greeted us upon arrival and gave us many beneficial tips about the area. The house is clean, spacious, and has amazing views of Hinckley Pond. A 5 star rental! Stunning home that acts as though it has 3 separate homes all built into one! The layout lends itself to a group setting but allows for intimate time away when needed. All decor and furnishings are extremely well kept and the linens are top notch. From the morning sun to the evening sunset, this home is perfect for those looking to soak in the scenery of a gorgeous pond that is offset by nearly an acre of grassy area made for building fires or relaxing in the sun. An upstairs loft is perfect for children and the master suite is a must see!! The other two suites are very upscale and well kept with private bathrooms throughout. The house is one of the cleanest I have stayed in thus far, and comes with all the upscale amenities one would expect. I highly recommend this home to families or a group of friends looking for a perfect location. I look forward to coming back to this gem for many years to come!!!! This is the heart of Cape Cod ! There is not a more perfect spot to spend a vacation during any time of the year !